All of our rabbits are health checked and have been altered - spayed or neutered. 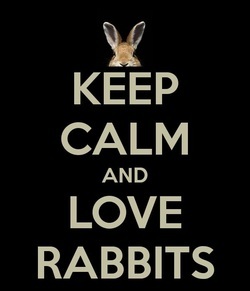 Female rabbits who are not spayed can have attitude problems from raging hormones. They may nip or grunt. Also, by spaying you reduce the risk of uterine cancer which can take a female rabbits life at a very young age. Spaying helps them become a more friendly calmer friend. Males are neutered for several reasons. Again, hormones make make a male rabbit very aggressive. They will be protective of their space and may bite. They also do a little trick called "spin peeing" to mark their territory. Very messy, very smelly, and very avoidable. Our rabbits also spend time with lots of human interaction to get them used to being held, pet, groomed and handled. It is very important for rabbits to relax during handling because going to the vet is stressful enough without being afraid during an exam. Our bunnies are used to being turned over for nail trimmings and "body checks". As well, they get lots of run time so they can remember that they have to go back to their litter pans. Our rabbits are also used to being around cats, dogs, and other small furries. Becoming a member of your household should never be a problem. Now, I hear a lot of people say that rescues charge too much. That they must do that to make money. Well I can answer that quickly. We make no money from rehoming our animals. We spend much more on each one than we will ever hope to get back. We do this for love. Sure you could get a "cheap" rabbit off the internet classifieds or from a municipal shelter, but is it healthy? Has it been altered? Does it know a litter pan? Could they tell you the animals background, its personality, its good and bad habits, its likes and dislikes? Are they going to be there for you when you can't clip nails or when you think you have a problem that may just require a simple solution? We offer pre- and post-adoption programs, classes, and assistance to help with any issue you may have. We are not just going to hand you a bunny and say "hey good luck with that." We support the families as well as rehome our animals. We hope you will consider all these things when looking for a new companion. Special needs rabbits are priced depending on situation. Email us and we can let you know. We also have supplies that you can purchase at discounted rates. An item like a carrier may be gently used, but we sterilize (clean with vinegar, then steam clean) ALL our items, to prevent transmission of parasites and/or disease.